Who Will Use These Lifts? What Are The Instructions To Use The Lift? What Features Does A Good Patient Lift Possess? What Should You Consider Before Buying One? How Much Do The Patient Lifts Cost You? One of the difficult situations one can experience is when elderly people cannot move from one place to another on their own.Every one of us know that health of a person degrades with age, especially after the entry into 50s. The reasons are plenty, but one of the symptoms is, inability to move from one place to another. Therefore, such people, be it patients or seniors, will need the assistance of a caretaker to help them move from one place to another. How nice would it be if there is a machine that can carry the person to the desired nearby location? Yes, there is a machine that can do similar work and satisfy your requirement. It is called as Hoyer Lift, which is portable. 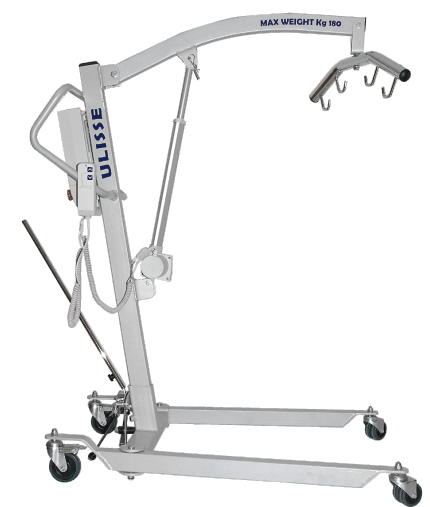 This patient floor lift is specially designed to carry and move the patients from bed to chair and vice-versa, toilet, bath and many other locations. Ceiling lifts are alternatives to these models, but they are expensive and not flexible. However, they are safer compared to Hoyer lifts. The patient lifts can run manually or through powered batteries. Usually, the patients or the seniors lie or sit in a sling, which is then lifted by making use of a lift. These lifts are intentionally constructed to help patients or elderly people, who are incapable to move their own bodies from one place to another. You can find these kind of machines being used in hospitals. You can even find them in some of the houses of those families that contain such patients or seniors. However, the person who assists the patient needs to be with the patient while making use of the lift. The main use of the lift is to carry or transfer the patient from one place to another, so that the patient can meet minimum and compulsory requirements like, carrying the patient till the toilet, bath place, from bed to chair or chair to bed, and so on. It is very difficult for the assisting person to carry the patient manually with hands, as the person needs a lot of strength. Even if the person has enough strength, carrying the patient in suitable position may not be comfortable. The lift makes use of two sections, first, a sling in which the patient lies and second, the lift that lifts the sling along with the patient. Before using the lift, one should know how to make use of the lift or else, the patient who is lying in the sling might be slipped off from the position while trying to lift the sling. Therefore, it is very important to understand the using methodology of the machine. After the patient is placed appropriately in the sling, the sling is hooked to the lift to transfer the patient to the desired location. While resting the patient onto the desired location, ensure that the patient is properly positioned to rest securely. Every product comes with a user manual that instructs how to use the machine in different scenarios. Below mentioned method is the basic one, and the methods might change slightly with the model. However, the basic theme of using a Hoyer lift is always the same. Sling is the section of the machine, in which the elderly person or the patient is allowed to lie or sit. Ensure that the patient is resting on the proper location of the sling before attempting to lift it. First, let the patient roll onto one side and then place the sling under the patient’s body. ​Then, allow the patient to roll back so that the patient is now resting on the sling. Let the patient to roll other side if necessary, and pull the sling further so that the patient rests on the correct position of the sling. Connect the loops of the sling to the lift. Ensure that the loops are evenly distributed on all sides so that the weight of the patient is balanced properly. Make use of the controls to lift the patient upwards until their body feels the touch of the surface. ​Ensure that all tahe loops are proper and secured. ​Ensure that the patient is comfortable in the sling. ​Now, raise the patient until the edge of the chair or furniture is reached, where the patient is desired to rest. ​After that, rotate the patient to face vertical side of the lift. ​If necessary, widen the gap between the legs, to balance the weight. ​Now, roll the patient to the desired point of location. ​Point the direction towards the wheelchair or furniture. ​Gently lower the senior, directing such that the resting posture on the desired location is appropriate. If necessary, push the knees of the patient backwards to facilitate while lowering the patient. ​Once you succeed in lowering the patient, tuck the sling in and out of way. ​Periodically, check the skin condition of the patient to find if it has undergone irritation or redness. When the patient is ready to use the lift, reverse the above mentioned process. Some of the patient lifts are designed to be portable. Unlike traditional rolling machines, these models are light-weight, foldable, handy design and space efficient. However, according to Kelecic, these machines are neither durable nor reliable. If you intend to use the lift regularly for a long period, then it is better to go for traditional rolling models. Folding method of certain models might need to make use of tools while, some of them might not. The patient who is being lifted will undergo less anxiety and the construction is made to focus more on the patient who is experiencing the lift operation. These kind of lifts are equipped with powerful rechargeable power-pack batteries, that needs 4 hours to get charged at the fullest. These lifts are very powerful and work perfectly to move the patients from one location to another. The performance is smooth and gives the patient a feel of comfort ability. The system is very easy and simple to manage, enabling the caregiver to concentrate on transferring the patient rather than on maintaining the machine. This reduces the chances of injury to caregiver and improves security for the patient. The battery can be charged during night times or when the patient is not using the lift. The lifts make use of high-torque electric motors, which are capable enough to lift the weights that are as low as 450 lbs. and as high as 1000 lbs. However, the specifications do change with models. Standing patient lifts also referred to as sit-to-stand lifts, serve to be very helpful when trying to lift a patient to change the body posture from sitting to standing. The action can be done safely, quickly and easily with little maintenance to the caregiver. These lifts are known by many terms like a stand up lift, stand aid, stand assist lift, standing patient lift or sit-to-stand lift. The standing lifts are one of the innovative constructions among medical devices that offer improved mobility and positive health effects to the standing patients. Traditional methods of transferring the patients manually involves lots of risk, strength, concentration, carefulness, but yet safety is not guaranteed. On the other hand, standing patient lifts can guarantee security to the patient, provided the caretaker makes use of the machine in a proper way. Minimum strength, chaos, maintenance and time is required to complete the transferring actions successfully. All the risk expected in manual transfer is minimized by making use of these machines. Pool lift is one of the types of patient lifts that enables the caregivers to securely work to transfer the patients into or out of a pool. Bathtub lifts allow the patients to bathe comfortably and securely. These machines lift the patient and lowers into the bathtub. They are available as battery powered or water powered. 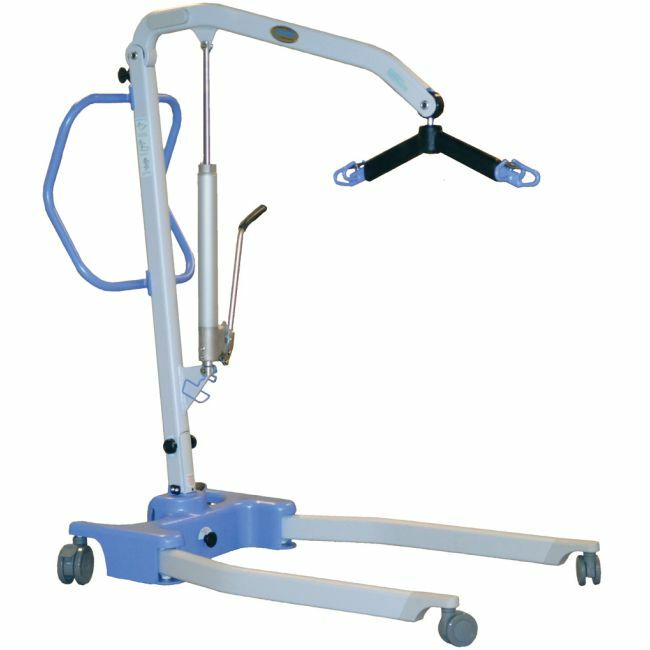 Ceiling lift is another type of patient lift that makes use of a sling in order to transfer the patient among the furniture like bed and chair, etc. These machines make use of sling, and are generally available in battery powered. The two main parts of a patient lift are the sling, and the lift. Sling is the part of the machine in which the patient is allowed to rest. Resting posture depends on the type of the model. Some of the slings enable the patients to sleep, while some enable to sit, and other allow to stand. The other main part is the lift that lifts the sling along with the patient. The sling is attached to the lift by hooking it with loops. The loops need to be hooked evenly in order to maintain proper balance for the lift. Sling and lift being the basic and main parts of the patient lift, other parts are also included in the construction that are assembled together to form sling and lift. The type of parts purely depends on the type of the model and the type of power the machine uses in order to operate. The list generally includes some of the most commonly used parts like digital scales, replacement hydraulic pumps, chains, batteries, battery charges, surface mount bath adapter. You can get these parts from the respective dealers and retailers. Also, you can get them online, provided you should be confident about the model of the part that you are purchasing. 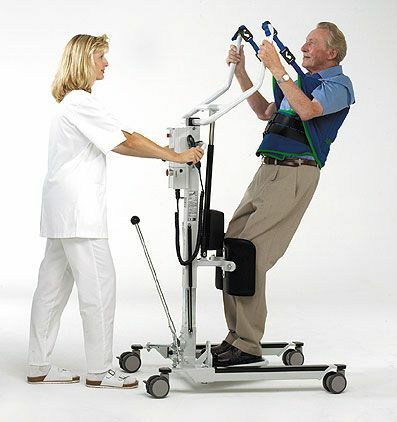 Though the basic method of functioning is common for all the patient lifts, a good one should possess certain features that will symbolize that the machine will not only benefit the patients and the caregivers by offering them security and comfort ability, but also will be durable and flexible. The patient lift should contain universal sling, which is one of the most flexible, simple, easy to use and maintain. The machine should be battery powered, which is the most convenient way to use. Such machines make use of power to operate lift and leg stance. 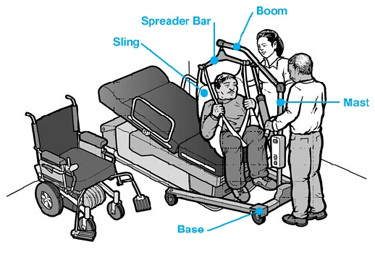 The machine need to withstand the weight of the patient, and the caregiver needs to ensure that the patient does not exceed the weight capacity determined for the lift. The machines should have facility to adjust the width between the legs in order to strengthen the balance. The machines should possess larger casters that roll easily over carpets and while making transitions among various floorings. You need to consider several factors before you finalize a model for yourself. First of all, know your requirement factors like, how long would you like to use the machine, weight of the patient, width of the entrance of your home etc. Below are some of the important factors that you need to consider so that you will not undergo hassle after you take it to your home. Your entrance width is one of the main factors you need to consider if you want to use it in your home. Flooring type is another factor, because it is quite difficult to use a Hoyer lift on carpet flooring. Castor size is the size of the wheels. The larger the wheels, the more easy it is to roll on difficult floorings. Battery powered is one of the best choices one can opt for, as these machines are easy and simple to use, making the life easy for a caregiver. ​The type of sling is another factor. This is the part of the machine where the patient rests while the lifting operation goes on. Universal sling is the best option, as it is more versatile and simple to use. ​Last but not the least is the duration for which you would like to use the machine. If the period is short, then can make use of foldable light-weight models that can not only save your space, but are also easy to handle. However, every model has its own advantages and disadvantages. To determine appropriate body posture and mechanics while lifting or positioning or transferring the patients from one place to another. To recognize and take measures to prevent risk factors that can result in injuries to the patient or caregivers while attempting to lift. To understand and illustrate proper usage of the lifting machines. To understand and illustrate proper way of positioning the devices while attempting the patients to rest in the machines. The training offered is important not only to the staff that use the machines, but also for the families that are interested to make use of the machine for their beloved ones. The content and guidelines of the training is generally constructed by the certified health care providers. Also, the product comes with a manual that contains content according to the information and guidelines provided by these certified health care providers. The price range varies according to the model of the patient lift. The more the features and the quality, the more is the price. Generally, these machines are found to be made available by the market, ranging from few hundreds of dollars to as high as few thousands of dollars. On an average, a manual patient lift costs around $500 while those that work on batteries can cost above $1500. A foldable patient lift can cost a minimum of $1400 to few thousands of dollars. Among all the types, the most commonly preferred ones are the battery powered lifts as they are simple and easy to operate and maintain. Hoyer lifts are the patient lifts, that operation on various types of power and are available for various purposes of serving the elderly people to transfer them from one place to another. It is quite difficult to take care of elderly people manually. Relying on physical strength while moving them to different places can threat unknown injuries to both the patient and the caregiver. Therefore, the medical innovation, in the name of patient lifts are made available to overcome such difficulty. You can opt for the model that best suits your requirement. Before buying one, identify your main goal for using the machine. Read the article and get an idea to achieve the model that best suits your necessity. Copyright text 2017 by PatientLiftSystems.Net.